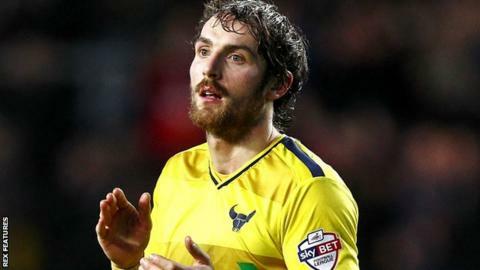 Oxford United striker Danny Hylton admits transfer deadline day interest in him from Hartlepool was only "mentioned briefly" by his manager. Hylton, 26, has scored six goals in all competitions for the League Two side this season, but has been left out by boss Michael Appleton at times. However, the former Aldershot player was not interested in a move north. "No disrespect to Hartlepool, I told the gaffer that I wanted to be here and be successful with Oxford," he said. "He said the same to me and it was quickly gone." Hylton's last goal for the Us came ironically against Hartlepool in November, but he is enjoying competing with fellow forwards Chris Maguire and Jordan Bowery to make the starting line-up. Oxford are currently third in the League Two table and have a date at Wembley coming up in April when they meet Barnsley in the Johnstone's Paint Trophy final. "It's exciting times coming up," Hylton told BBC Radio Oxford. "Everyone wants to be part of it and you have to make sure you give your all in training. "I think our squad's stronger this season and that's reflected in results."